Mine That Bird dug up a miracle, stunning the field to win the Kentucky Derby with a dynamic stretch run through the mud Saturday at Churchill Downs. The 3-year-old gelding and jockey Calvin Borel found room along the rail deep in the stretch then pulled away for a 6¾-length win to give the 50-1 long shot one of the biggest upsets in the 135-year history of the race. 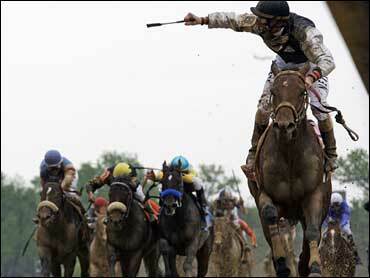 It was the largest margin of victory in the Derby since Assault won by eight lengths in 1946. Barbaro won in 2006 by 6½ lengths. The Derby win was the second in three years for Borel, who used a similar stretch run to send Street Sense to the winner's circle in 2007. "Calvin did a super job," winning trainer Chip Woolley said. "I just can't say enough about the way things went for us. Calvin picks a spot, every thing fell together. We were really lucky to get through there." Mine That Bird joins Giacomo, who won in 2005, as one of the most unlikely victors in the Run for the Roses. The son of Birdstone covered the 1¼ miles in 2:02.66 and paid $103.20 to win  the second largest in Derby history behind Donerail ($184.90) in 1913. Pioneerof the Nile held off Musket Man for second, but neither was a match for the unheralded horse from New Mexico, who became the ninth gelding to win the Derby and just the second in the last 80 years. Funny Cide won in 2003. Friesan Fire, who became the favorite after I Want Revenge was scratched earlier in the day, finished 18th in the 19-horse field. Borel thrust his right arm in triumph as he crossed the wire, and Woolley hobbled to hoist the trophy. The trainer from New Mexico broke his right leg in a motorcycle accident over the winter and drove his stable's star 21 hours to Churchill Downs. "They'll know who I am now," Woolley said from underneath his massive black cowboy hat.